The Question and Renee hold up a flashlight bat signal, hoping to call down Batwoman. It succeeds. They tell her about the prophesy that indicates that she'll potentially be killed by Intergang. In Australia, a group of men come to evict the "Tornado Dreams" group of folks (not sure if it's a tribe or collective or what, so I'll just say it like that - N). When they arrive, the guy who was tinkering with Red Tornado releases him. Tornado starts spouting "52" while attacking the movers. The townspeople turn on Tornado unexpectedly, bashing him with sledgehammers. Tornado's head is hauled off for salvage, and the town becomes a uranium mine. In space, the exiled heroes flee the giant head as it shoots green beams. They're out of their element, Animal Man laments. In a church, Batwoman stomps a giant lizard figure, telling them that the prophecy has failed. Bruno Mannheim pops in, attacking Batwoman and subduing her. He's about to finish her when Renee and Question attack. Bruno recoils, surprised, stating that "The Questions" shouldn't be there yet. The spacefarers attempt to set a trap for the giant head. The head arrives early, and becomes entrapped in the bones surrounding their last stand area (I think). They see that there is a Green Lantern trapped inside the head (or maybe it is the head?). The head (or the passenger, it's unclear) states that the Stygian Passover is on the way. Somehow, from this (I can't find the causation, this isn't just a reviewer being obtuse, I tried) Starfire divines that Lobo took the eye that the head was using to defend its galaxy from the Passover (I believe). They realize they have to deal with the Passover. Basically what it states, Catman's origin. Main Story - 2: Odd, I've been enjoying most of the issues of late, but this one just struck me as rushed or badly done, take your pick, mostly owing to a lack of clarity in several of the scenes that were key to the issue. It also read like a padded issue when not dealing with Batwoman, and failed on multiple levels for it. Hard to imagine that a 52 issue series doesn't pad now and again, but so far this is the only time I felt "Hey, that didn't need so much evaluation." The scene with Mannheim and the scene calling in Batwoman was awesome, played well, and advances a plot that I'm enjoying. As I've said before, I'm not digging on the whole people lost in space thing, so it has to be pretty cool to keep me going. Lobo doing something hilarious, there being a point to it, etc. Here, we had this promise of a giant head that looks really cool, but the scene is corrupted by an atrocious causal line, dialogue that tries too hard to be cute, and the unreality of being chased by a head for 5 days when the head's intentions are benign (It's a frickin' Green Lantern) assembly without any kind of closure or final confrontation. If it's a Green Lantern, it could stop all of them but Lobo in a flat second with a bubble. If it's something else, that's not made clear by the text. I'm still confused (and I looked review carefully) as to whether the head is an entity a Lantern is trapped in, or if the head is what's causing the Passover and killing people, or if the Lantern is controlling the head as a weapon, or what. And there's absolutely no causation (given Lobo's response) to Starfire's Chloe-esque total assumption leap. Yeah, it's Lobo, so he's obviously gonna be behind stuff, but characters jumping to that conclusion without reason doesn't play for me. There's also the question of whether Lobo removed an eye...or what. It was odd, I couldn't figure out what he was doing. Also, I'm confused about why the villagers would turn on Red Tornado. The scene seemed without passion on most of the character's parts, and I don't understand where the place is, why it is, maybe I'm just being forgetful, but all I recall is the guy discovering Red Tornado. From there, the whole scene is a complete mystery. And I am paying attention, so the only reason I don't recall is because the original impression of these characters made no impression, and it certainly didn't this time around, so that means it failed. So while one of the stories was excellent in this issue, the other two failed miserably, so balancing out one five with two ones gets you a two, by my reckoning. But then, I'm a writer, not a mathematician. Also, typos bad: "Ya think I brought ya along fer any other reason, my son!" What does 52 mean? I'm curious. That's a neat plot line. And what's this about "The Questions?" It seems obvious that Renee would make a great successor to Question, and multiple people have suggested that...I would like that. Art - 4: The art is still coming along well. The scene with the head and Lobo in the foreground is particularly excellent, and the fight scene with Batwoman ruled. The cobbled Red Tornado also had a lot of great panels. All in all, the quality is maintaining and still great. Back-Up Story - 3: Catman isn't really that big a player in the DCU, and while they made him cool again with Villains United, I don't really understand why they're popping him ahead of so many others that could come first. It was neat to see homage to his bad times, and point out his first appearance and subsequent actions...but I'm left saying, "This is Catman." Doesn't matter how cool you make him in one series, you've got more than an uphill battle to make me believe he's a major player in the DCU worthy of the same attention the other characters are getting. 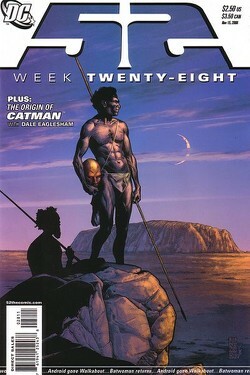 Back-Up Art - 5: Part of the only reason Catman played in Villains was Eaglesham, who does a great rendition. Great work. Cover Art - 5: Beautiful image, relates to the story at hand, nice coloring, relates to what's going on. Another in a LONG line of really beautiful covers. This series surprises me with how well it maintains cover quality.